These beautiful glass beads can be sprinkled over Designer Dries Clear Adhesive on projects. Choose between large and small sized beads or use together for varying degrees of dimension. The large beads measure between 1.25 mm. and 1.5 mm. 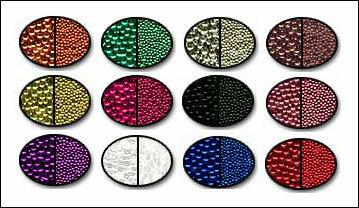 The small beads range from .50 - .75 mm. The jar size will contain 1 oz. of beads. The colors shown in the pictures are listed in the same order as the drop down menu where you choose your color and size of bead.